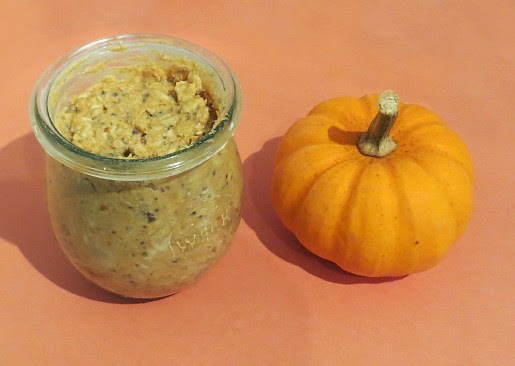 I'm loving this super easy overnight pumpkin oatmeal and have already made it a bunch of times. I know the container looks small, but it's the same serving size of oatmeal that I always eat. If you don't have any pumpkin pureed sweet potato works equally. If you have some more time in the morning you definitely have to try Baked Pumpkin Oatmeal. Mix all the ingredients then pour into a mason jar. May be eaten cold or warmed up in the microwave. 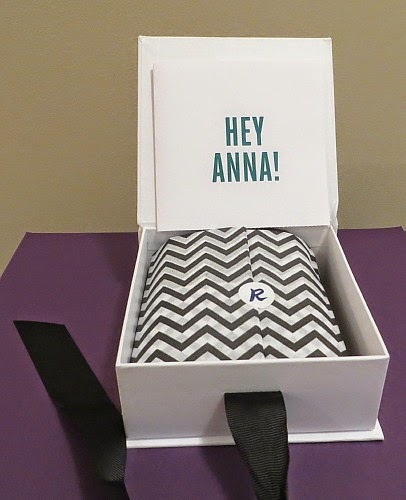 I love subscription boxes, and well generally getting anything fun in the mail! 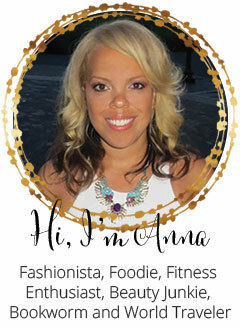 For beauty products I get Allure's Sample Society and now for jewelry I signed up for Rocksbox. 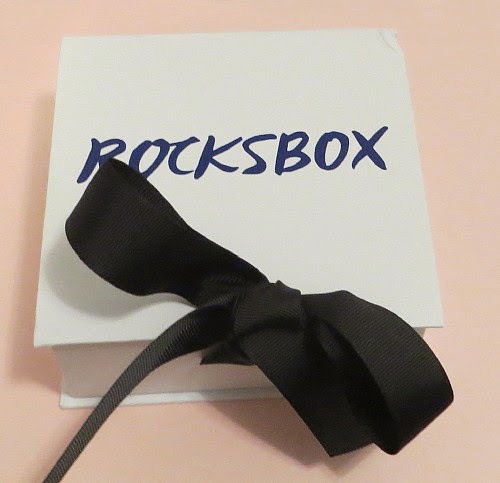 What netflix is to DVDs, rocksbox is to jewelry - a monthly subscription service! 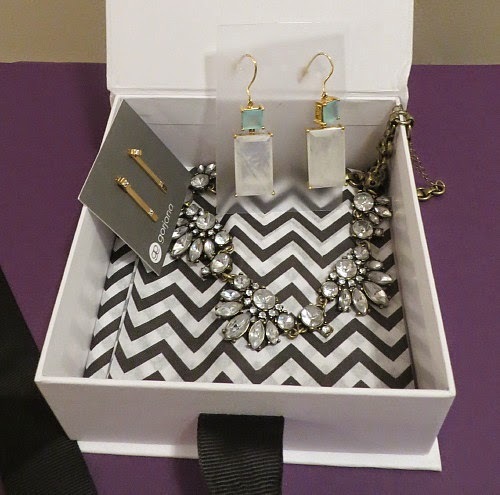 For $19 a month they send you a box (with a pretty black ribbon) with 3 pieces of designer jewelry based on your style profile. You can wear the items on loan for as long as you want or return them as fast as you can for your next box. 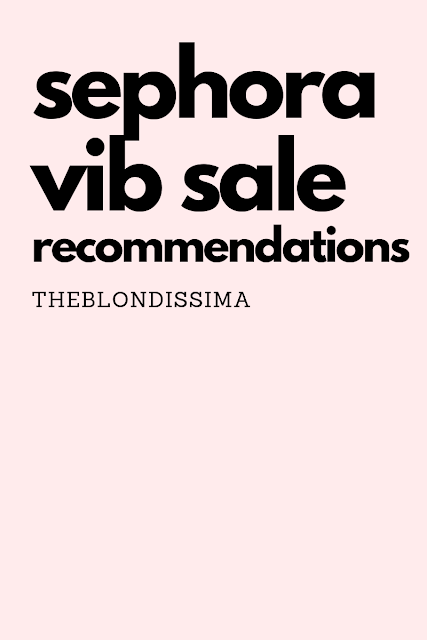 There is the option to buy the pieces they send you but I love have the variety of pieces to wear to keep my wardrobe fresh. They include a free shipping back to return the items. From my first box I liked 2 out of the 3 pieces so I went back and adjusted my survey answers to make sure it's a better fit next time. They even have a wishlist section on their website so you can mark which items you'd like next. I love fresh udon noodles, the kind you get in restaurants. Unfortunately the dry packages you buy at the grocery store doesn't just taste the same. But you can see the meals I made with udon noodles here and here. 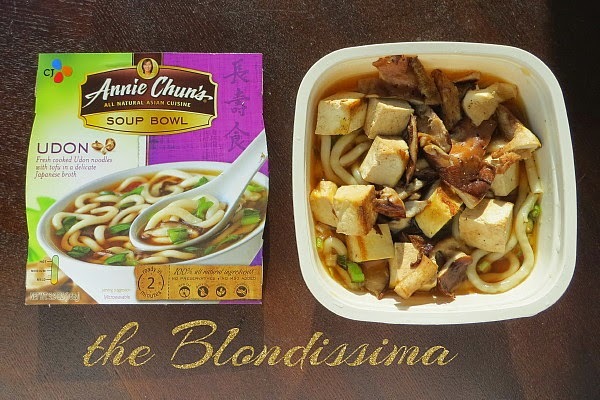 Then I came across Annie Chun's Udon Soup Bowl available at Trader Joe's or Target. The noodles are thick and delicious! I added tofu and shiitake mushrooms to make it a more complete meal. Try it out and let me know what you think. 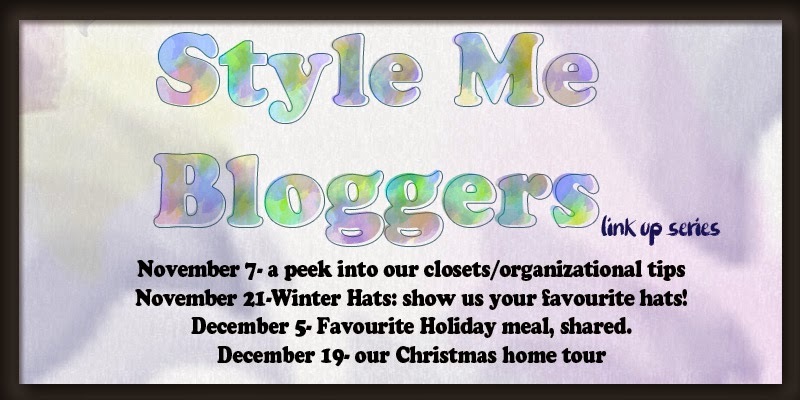 I'm always one to have a stylish hat in the winter time, got it from my mother. 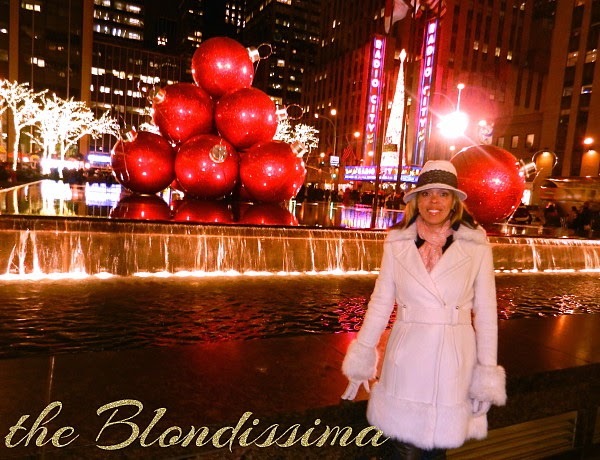 In the past 10 years I've gone through 4 white coats and 4 white hats. People tell me they're afraid to wear a white coat because it'll get dirty which I don't really understand because I don't eat with my coat on, don't like coffee, don't sit on public benches so I have yet to stain my coats. Only my gloves get dirty from the metro handrail with black grease so I hand wash my gloves often. If you're looking for a new hat for yourself, check out some of these that come in a number of colors. 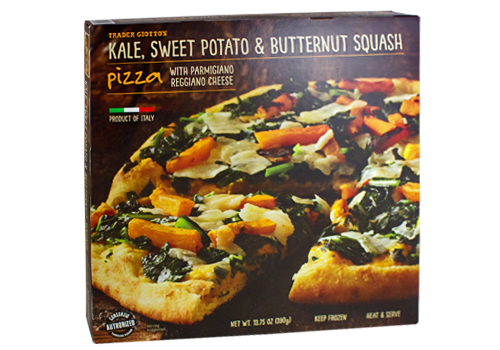 The thin, crisp crust is spread with a sweet potato purée, and then topped with kale, grilled butternut squash and shaved Parmigiano Reggiano. This pizza is incredibly delicious, I'd say the sweet potato puree is the secret ingredient that gives this pizza it's extra kick. It's such a unique flavor combinations with all the ingredients that I've never seen before on a pizza, you gotta try this! With fall comes the arrival of hot apple cider right? Or as Trader Joe's calls it "autumn joy in a glass". This year TJ's has stepped it up a notch by only using honey crisp apples in this bottle! Unless you've been sleeping under a rock, you should know that honey crisp apples are the most delicious (and expensive) apples ever! 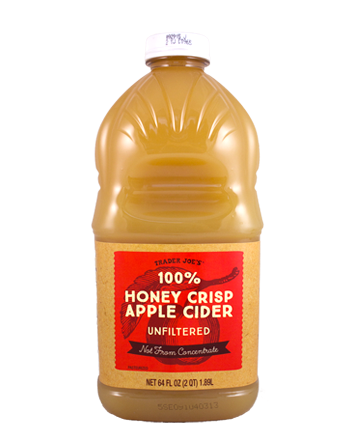 If you're wondering why you should switch from TJ's Spiced Apple Cider, well just look at the ingredients it's made of a variety of juices, while TJ's Honey Crisp Apple Cider has only one ingredient and no added sugar. The secret of the deliciousness is in its simplicity and purity. I've been mixing it into my Vanilla Shakeology. 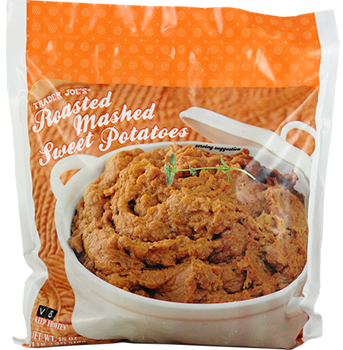 Roasted Mashed Sweet Potatoes - I know you're thinking how lazy does one have to be to buy this? Well the package is made up of a bunch of small mashed frozen discs which microwave in less than 30 seconds so it makes using it so fast and easy. There's only one ingredient - sweet potato, roasted to caramelize their natural sugar so it's really delicious. I've been experimenting adding it to my oatmeal. 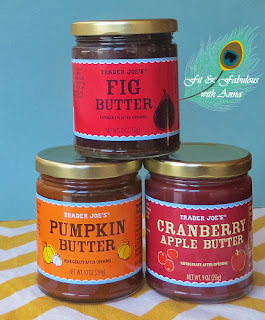 This time of year I also pick up my favorite apple butters: fig, pumpkin and cranberry apple. 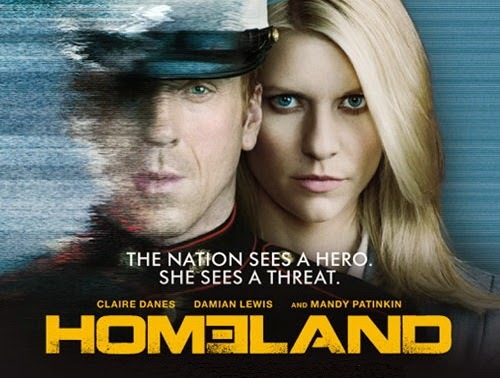 I'm addicted to the Showtime drama Homeland that I've been watching on netflix. It's a fantastic gripping drama so much so that it's won two Golden Globe awards for Best Television Series in a Drama. Claire Danes has won both Golden Globes and Emmys twice for her performance on the show which is highly deserved. Every episode is full of twists and surprises that it keeps me on the edge of my seat in suspense. I can't recommend it enough, you'll love it! Carrie Mathison (played by Claire Danes) is a CIA operations officer on probation after carrying out an unauthorized operation in Iraq. As a result, she has been reassigned to the Counter terrorism center. While in Iraq, she was warned that an American prisoner had been turned by Al-Qaeda. When Nicholas Brody, a U.S. Marine Sergeant, is rescued after being held hostage since 2003, she suspects that he is the turned American prisoner. Brody is received home as a war hero, so Carrie goes to any lengths possible, ignoring protocol, to catch him out. 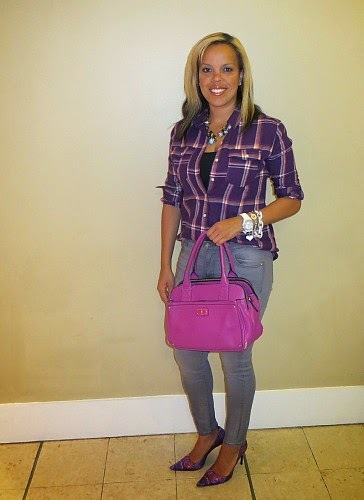 I bought my first pair of grey jeans because of the Fall Fashion Challenge, check out yesterday's look. I've never owned grey jeans before and it was a challenge to find just the right shade of grey. 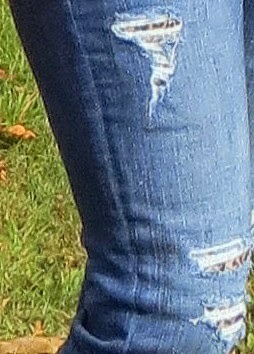 Some jeans looked like faded black, or 80s acid wash jeans, these jeans that I bought were the perfect light grey color. 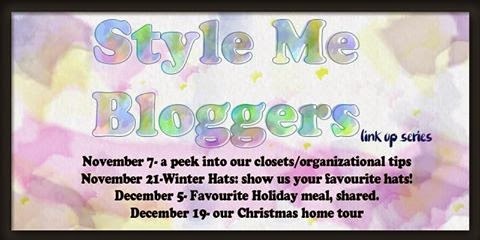 I've found that grey jeans coordinate really well with burgundy, mustard yellow, cobalt blue, pink or purple. I've never been a fan of plaid but that was another thing on the challenge shopping list. This shirt is a bit oversized, but it doesn't give that lumberjack look. I absolutely love this color palette, it's a feminine way to wear plaid and I think the shoes and accessories pull the look together. If you saw the movie The Good Lie Reese Witherspoon is wearing a plaid shirt in every scene. Allure magazine's November edition has a whole page dedicated to "How to wear plaid" with an interview with Tommy Hilfiger. He said that "while plaid cycles in and out it never totally disappears because it is an incredibly chic look when you wear it the right way." He recommends getting your plaid in a silk fabric because "it's lightweight and feminine and offsets any unwanted lumberjack associations." He likes "crisp bright colors for plaid and says to stay away from dusty, muted shades like beige, olive green and brown because they look muddy." The accent color on the plaid must be white. He says it looks perfect in a ski town but don't mix it with turquoise jewelry. 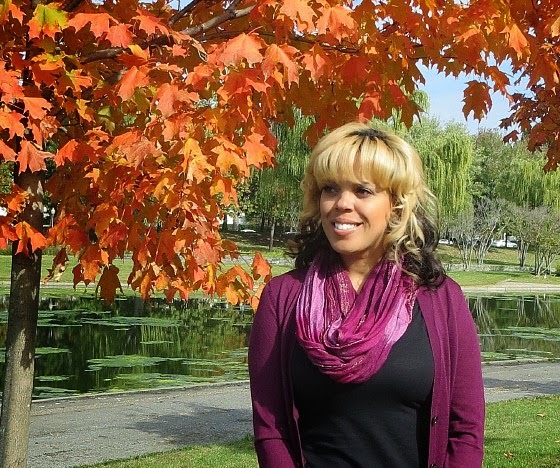 I had a lovely relaxing weekend enjoying fall before it gets too cold. 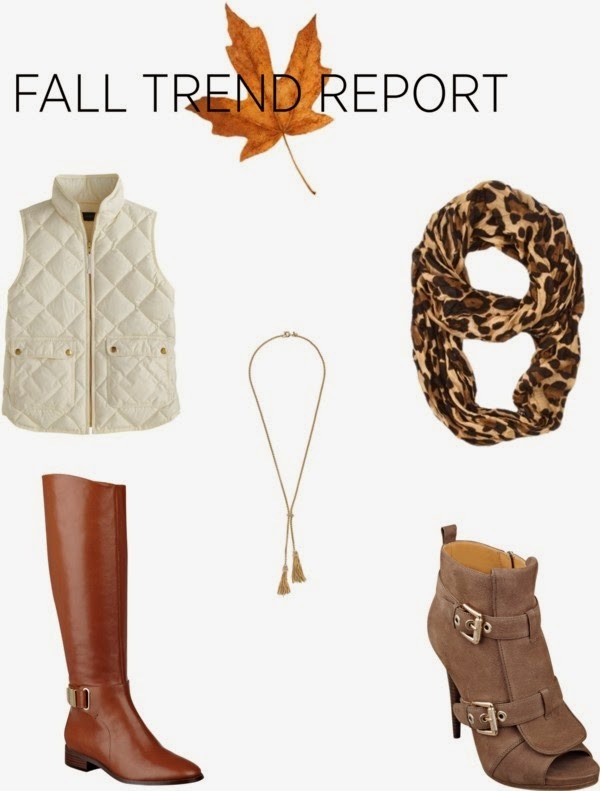 I'm still wearing my fall inspired looks from the Fall Style Challenge. 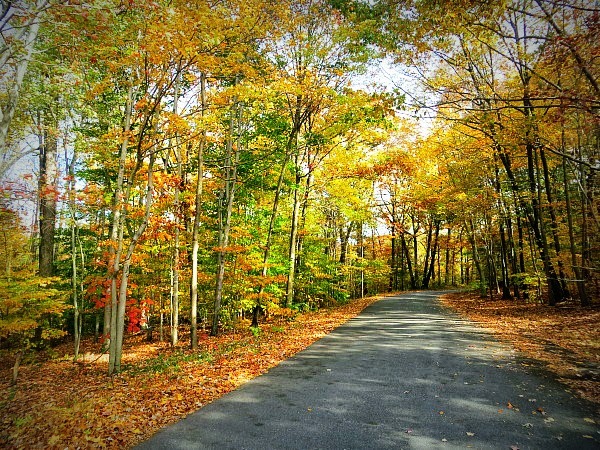 Saturday morning I visited my local Arboretum and walked the trails for 3 miles to see all the beautiful fall leaves. It's a free part of the city and I like to visit at least once a year if not more often. 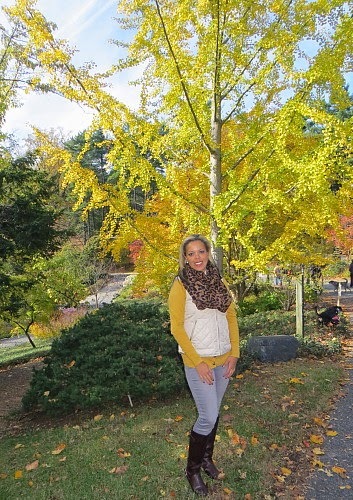 Fall is the perfect time of year to explore the arboretum and I think I went at the peak bloom because I saw lots of dramatic fall color! 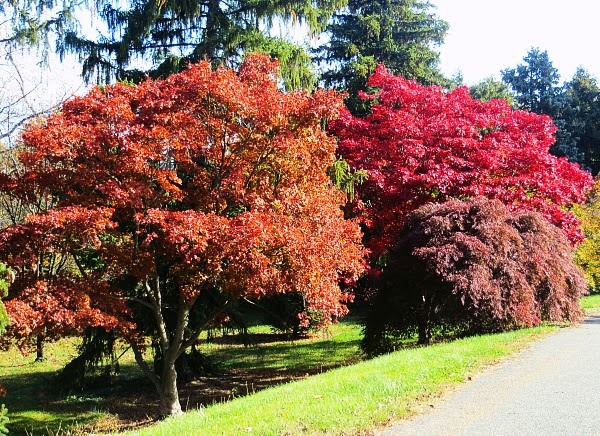 I absolutely loved the red Japanese maple trees which is a dark burgundy color. 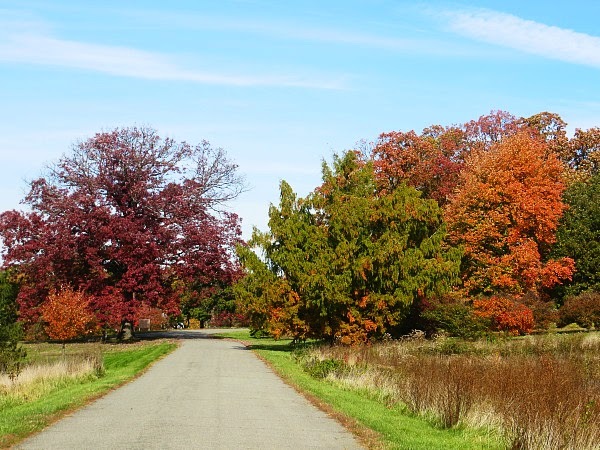 Wandering around the gardens I also saw Gotelli drawf trees, conifer foilage (which remind me of Christmas trees), and dogwood trees that had turned a pretty red. Then there were fall blooming camellias bushes which look similar to roses and exotic ornamental grasses. 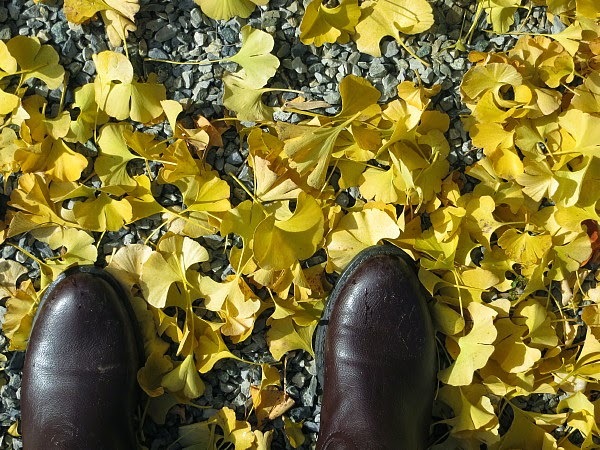 I have a thing for the color yellow so I enjoyed see the ginkgo trees and witch-hazels. 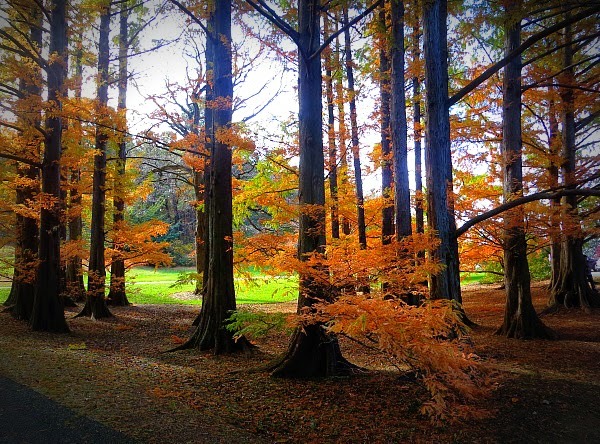 I definitely think it's worth a look to check out your local arboretum or gardens to see the amount of beauty that nature has to offer. 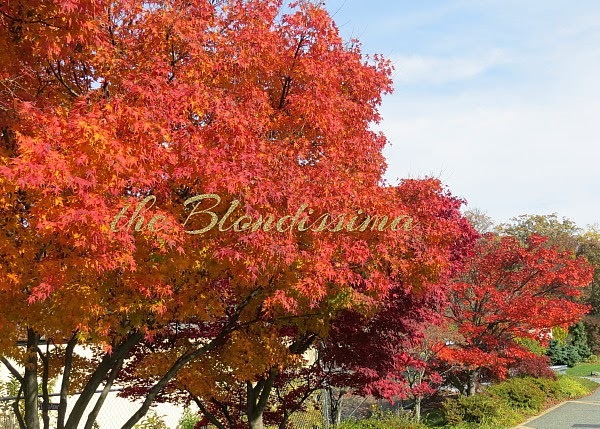 Three shades of red - so beautiful! 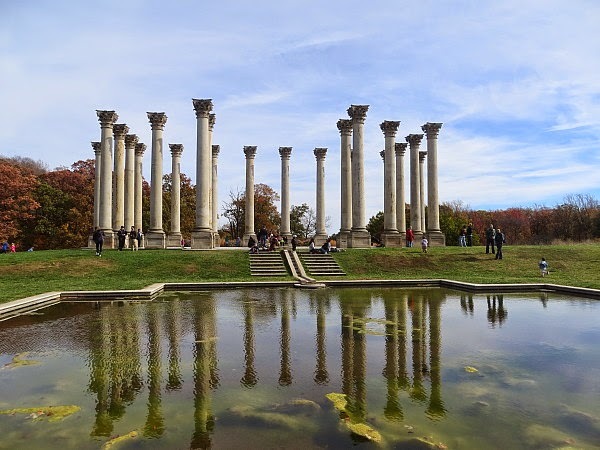 These 22 Corinthian columns were originally built for the National Capitol building, but after discovering they weren't the right size once the dome was completed they were removed and found their final resting place here in the 1980s. 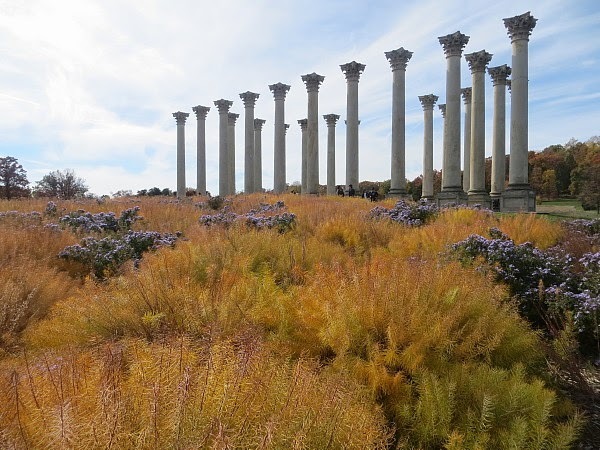 The reflecting pool reflects such a pretty image of the columns. 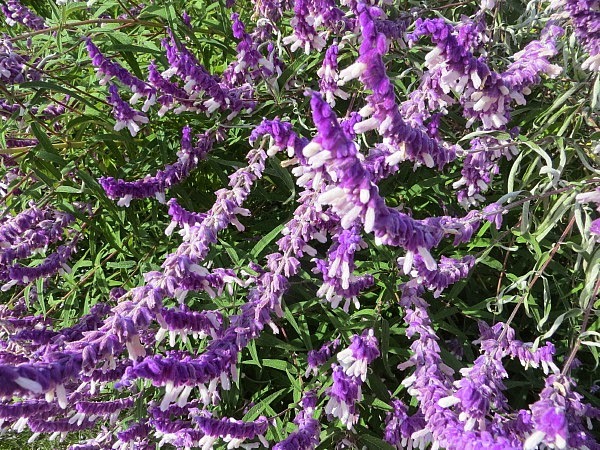 In the herb garden they have a collection of sage plants, my favorite being the Salvia leucantha 'Midnight' which has purple velvety leaves. 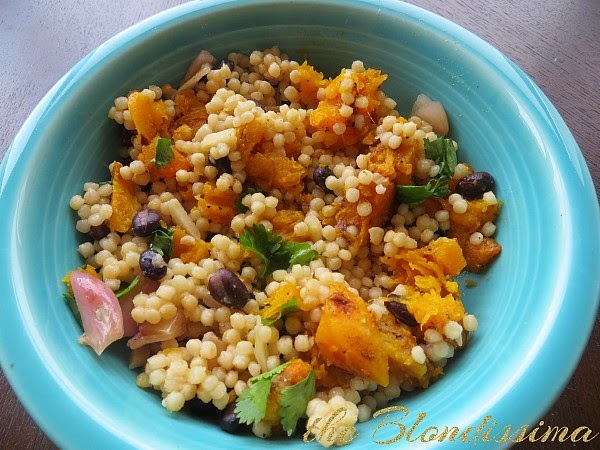 When I came home I made one of my favorite fall recipes: Butternut Squash Risotto. I tweaked the recipe a little adding black beans. 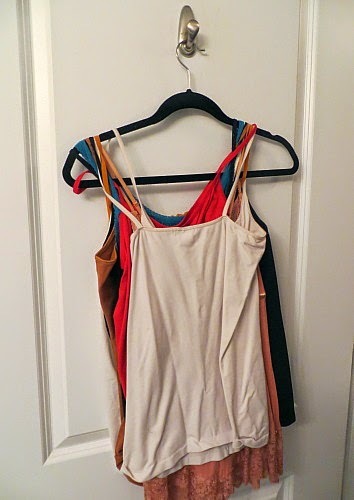 Ugh my cami collection used to be the biggest hassle! See first I used to never be able to find my camis because they were in all random places and that's why I now have 2 white camis and 2 black camis because the first pair went "missing" in my closet for an extended period of time. 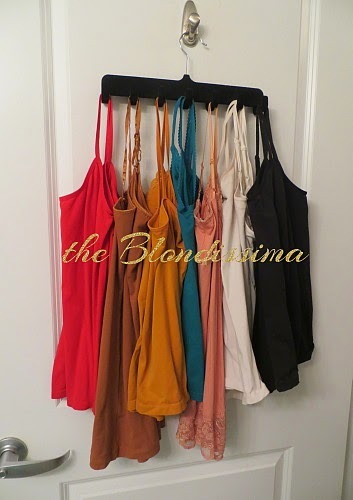 lol Then I came up with the "bright" idea to keep all of them on one hanger so I would always know where they were. The problem with that is to take one cami off I would hope it was an outer cami that would just slide off, but nope most of the time I would have to remove all of them to get the one I wanted, annoyed me every time! Then I bought this belt hanger from Bed Bath and Beyond that is made of velvet fabric and provided a simple solution to something that has aggravated me for so long!